Quite possibly, my least favorite month of the year, having been ready for winter to be over since the first week of January, February seems to drag on in the most torturous fashion. Arctic temperatures and snow fall one day, only to be followed by a teasing, yet cold sun and melt off the next. To be fair, the only advantage March typically has over February is a greater percentage of non snow days. Can we not simply fast forward to May? On those infrequent days when the sun streams tauntingly through my windows, I am, at once, struck by the things it illuminates. Like the fact that my windows need to be washed. As the snow melts away, I am further tortured by all those little projects we didn't get around to completing outdoors in the fall. Like the perennials I didn't cut back and the blasted stump. When we purchased our home a couple of years ago, one of our very first projects, along with resurrecting the inground pool, was tackling the neglected landscaping. The previous owner, or their landscape architect, had been a great fan of rocks and arborvitae. Unfortunately, the previous owner had not been a fan of trimming the arborvitae. I can only assume there was a loose, live and let live relationship. While I am generally not a proponent of unilaterally removing growing green elements, I will share that arborvitae are far from my favorite landscaping tree. Although I was able to work minor miracles with a number of them, one in particular was destined to be reborn as wood chips. As this stubborn arborvitae was eight feet tall, having grown into a most unappealing and uncharacteristic shape and was primarily brown, I harbored no remorse whatsoever in chopping it down, leaving in it's place the blasted stump. Not one pang of guilt did I feel, as we fell the ugly tree. At the time, the Teen Diva was still playing basketball on her school team and we were looking forward to placing a basketball hoop in the very spot. Of course, with so many other pressing projects, contending with stump was pushed down on my husband's Honey Do list. The debate as to whether to dig it out, burn it down or have it professionally ground out was set aside and the blasted stump still stands. 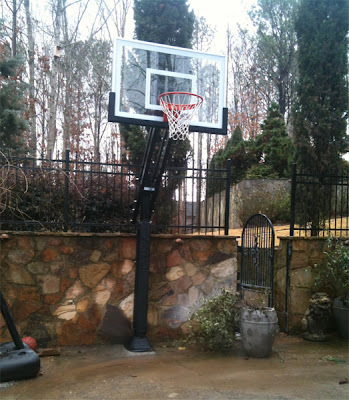 At the time of the arborvitae's demise, basketball season was fast approaching and we needed an immediate solution. Predictably, we took the easiest route and bought a portable hoop system. At first, this worked well, as we were able to place it further down the drive from the blasted stump, affording my daughter the luxury of practicing whenever she desired, as well as fun for the boys. Providing an fun alternative for outdoor play for the regular parade of pool guests, the portable basketball system was a huge hit, that is, until winter rolled around. As we battened down the hatches for winter, my husband and I found ourselves in front of the portable hoop. The base filled with water, sans antifreeze, and not looking like it would fair well through the bitter winter months - what to do? Too large for the shed. Storing it, as was, in the garage would mean someone's vehicle would be parked in the drive all winter. With no one volunteering for that unpleasant sacrifice, my husband set to work on dismantling the portable hoop for storage. Some time later, said husband was crystal clear in his proclamation that another solution was absolutely necessary for next year. Revisiting the issue of the blasted stump, my husband was also happy to declare that pigs would fly before he tried to dig it out. Understandable, considering we both strongly suspected the arborvitae had been growing in all it's unappealing glory for thirty years or better. Trying to burn it out with chemicals is something we've never tried before and due to it's proximity to the garage, an idea that I'm really not very enthusiastic about. With those options knocked out of the running, we decided there was nothing left to do, but to hire a professional to grind the blasted thing out. On the more positive side of things, we'll finally be able to install a sturdy basketball hoop, an in ground model of the type that sport solid basketball backboards. Although my son isn't old enough to really be rough on a hoop, with the portable model, with countless teenagers about enjoying the pool in the summer, we had more than one occasion when I didn't think the portable unit would withstand their...enthusiasm. This Mom is all about shopping, so I searched around online and found a great replacement hoop. Designed for our intended placement, sturdy enough to withstand the throngs of enthusiastic teenagers and adjustable in height, to accommodate my ten year old son's friends, it's the perfect choice! What are your spring spruce up plans this year? Do you have major renovations in mind? Have you had to tackle a blasted stump of your own? Tell me in a comment below, I'd love to hear about it! The opinions and experiences above are both honest and my own. 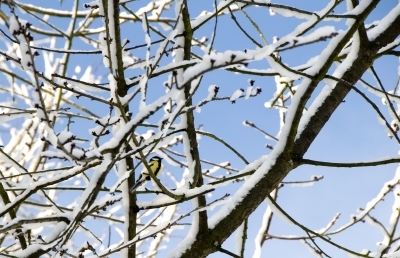 Winter Image. Please see my disclosure policy..
No sprucing up plans, but we just got our 4th lemon tree, I'm ordering 2 (or 3) apple trees, and some strawberries, and we're getting ready to start gardening! But that hoop looks nice. Happy to be your newest follower via the weekend blog hop. Loved your profile upon my initial visit. The focus on all things green is wonderful. Loved reading your post and can't wait to come back soon and play. We'll be moving into our new, un-landscaped house at the end of May...it will be fun to start fresh. I wonder what the buyers of our existing house will do with the landscaping once we move...no arborvitaes! I am your newest follower, via the weekend hop. I am loving your blog and I do hope you will come visit us and follow too! My spring plans include trying to help my herb garden regain its former glory! I think landscaping is never ending at our place. We always have new ideas and new plants to grow.